There is a book series that I love to reread a couple of times a year. I like it because of the transformation of the characters – the fantastic nature of the post-apocalyptic world that develops when the fantastical becomes real. It takes many of the celtic mythologies and brings them into the present. Sort of a “what if fairies weren’t what we thought and they were real and evil and all”. It is far from a book about rainbows and sunshine. And even though the author got her start doing romance novels, this is far from a romance novel series. It is about a woman who things her world has changed when her sister is murdered in Dublin. But realizes when she goes to find the murderer that the murder was only the tip of the iceberg. This book series is called the Fever Series by Karen Marie Moning. This is the advice one character is giving to another. 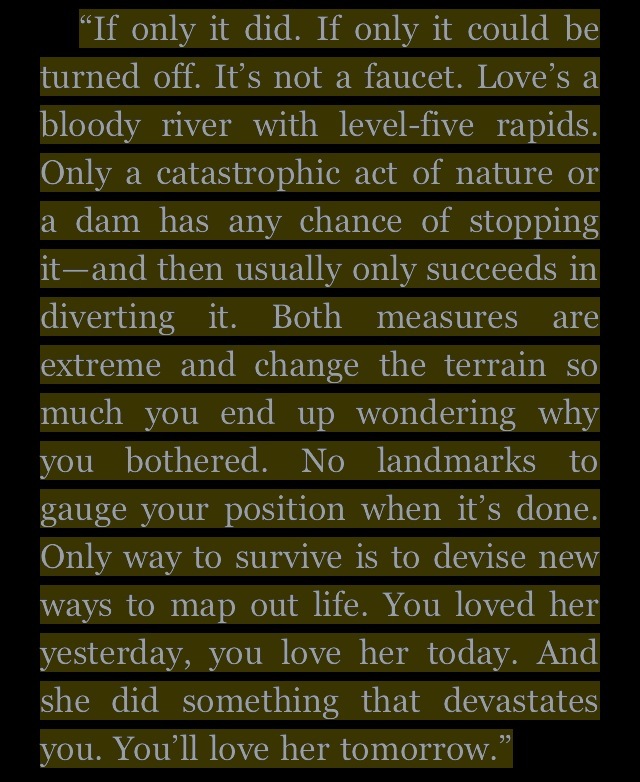 And I think summarizes how I feel – wishing for an off-switch, but feeling in the middle of an emotional rapids.